To combat hostile environments, this general service gauge is corrosion, weather, and dust resistant. Mounting versatility, excellent readability, and sustained accuracy make this stainless steel design a gauge leader. It can be stem, surface, or flush mounted. Sustained accuracy and excellent readability are especially important to users of the OMEGA™ general service gauge line. 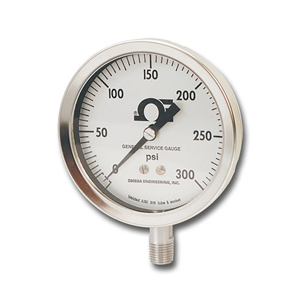 Meeting the requirements of many industrial applications, general service gauges can be used on steam boilers or other pressurized vessels; on pumps and compressors; on many types of industrial machinery; in the chemical, petrochemical, and allied process industries; in power plants; and in pulp and paper mills. The pressure gauge actuation system in the OMEGA general service gauge line is the standard 316 SS Bourdon tube system, which is engineered to precise tolerances for repeatability and consistent response to pressure fluctuations.